President John Agyekum Kufuor will give an account of his stewardship in a State of the Nation Address to Parliament, today Tuesday when the House reconvenes for its final session before its dissolution. This would be his last sessional address to the Third Parliament of the Fourth Republic. It would also be the final address to dozens of Members of Parliament (MPs) who have retired, lost the primaries of their parties or were defeated in Election 2004. The House took a break on December 22 for the Christmas holidays and would sit for two days before its dissolution. 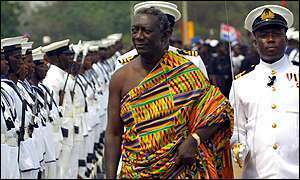 Great fanfare, rich Ghanaian culture, traditional drumming and dancing are expected when President Kufuor arrives in Parliament at 0800 hours. A guard of honour would be mounted to welcome him. Mr Jones Kugblenu, Director of Public Affairs of the Parliamentary Service Board, told the GNA in an interview in Accra that the House would also sit on Thursday to conduct its usual business during which some reports would be considered. Thursday's meeting would be the last for the 200-member Third Parliament, which would go through dissolution at midnight, according to constitutional provisions, to make way for the new and expanded Parliament made up of 230 members. The New Patriotic Party (NPP) has 128 seats in the new House with the National Democratic Congress (NDC) having 94 seats. The People's National Convention has four seats, the Convention People's Party (CPP) three and one independent candidate. On January 7, the new Parliamentarians would be sworn in and a new Speaker elected after which the House would suspend its sitting to reconvene shortly afterwards at the Independence Square where President Kufuor would be ushered into office to begin his second term of office. President Kufuor won 52.45 per cent of the votes in the December 7 election. Mr Kugblenu said on the evening of Thursday there would an awards dinner dance where the 200 outgoing MPs would be given certificates of recognition for their service. Special awards would be given to members, who distinguished themselves in the House.